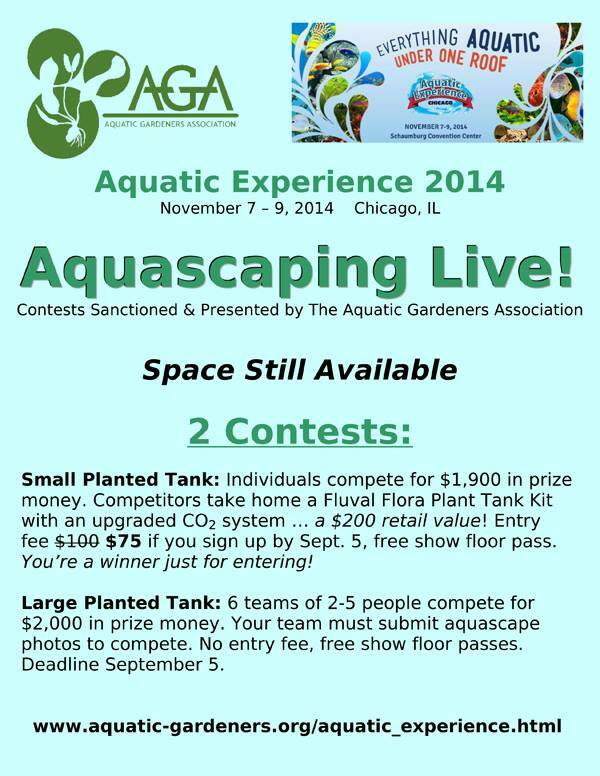 The Aquatic Gardeners Association (AGA) is bringing a live aquascaping contest to this year’s Aquatic Experience, held in Chicago, IL, USA! What does a live aquascaping contest look like? If you’ve never seen a live aquascaping contest in person, check out this video of Napoli Aquatica’s 2013 LIVE Aquascaping Contest. Who will get to compete in “the biggest LIVE freshwater aquascaping contest to be held in North America”? A maximum of 28 individuals will compete in the small tank category for $1,900 in prize money. In addition to potential prize money all small tank competitors will take home a Fluval Flora Plant Tank Kit with an upgraded CO2 system … a $200 retail value! The small tank contest is open to all levels of aquascapers. There is a $100 $75 entry fee to participate in the small tank contest. You’re a winnner just for entering! Six teams (2 – 5 members per team) will compete in the large tank category for $2,000 in prize money. All team applications will be screened by the Aquatic Gardeners Association with the top 6 receiving invitations. There is no entry fee for the large tank competition. Deadline Sept. 5, Teams chosen Sept. 9. We should also point out – if you’re participating in the aquascaping contest, you get into the Aquatic Experience for free too! Winners of course get bragging rights for a year; nevermind the large pool of cash prizes! The main thing competitors must furnish themselves are the aquascaping materials (substrate, hardscape, plants etc), and a bit of creativity! Be sure to visit the live aquascaping contest page on the AGA website for full details, rules, and entry forms.